Tandem Financial | Charity Bike Ride for Keech Hospice Care – please sponsor us! 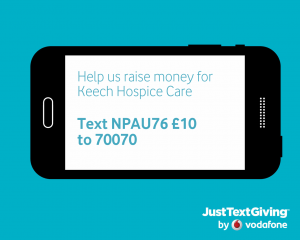 Charity Bike Ride for Keech Hospice Care – please sponsor us! 20 Jul Charity Bike Ride for Keech Hospice Care – please sponsor us! On Sunday 17th September 2017, Kevin and I will be riding a tandem bike (go figure) 54 miles from London to Brighton for Keech Hospice Care, one our partner charities at Tandem Financial. It happens to be my birthday (as well as my son Miles’) and it is Kevin’s wedding anniversary! 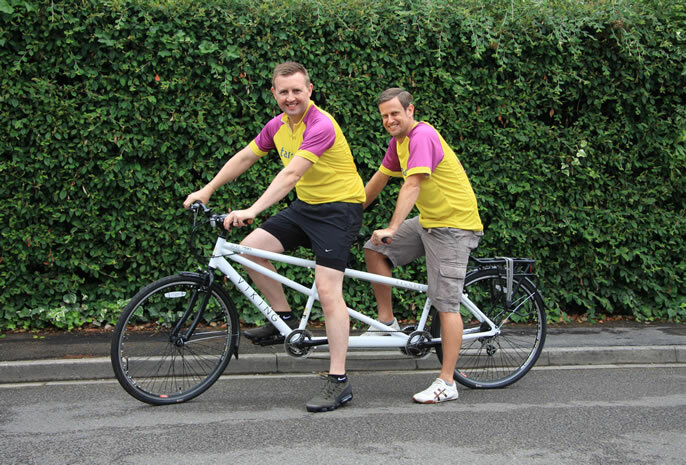 The tandem has been purchased, we have had tops made; all we have to do now is get bike fit! We are aiming to raise £3,000 so please dig deep and help us with such a worthy cause. You can DONATE using THIS LINK where you can see a few more pictures and updates. We will be adding progress pictures to the site. Or you can text NPAU76 £10 (or any amount) to 70070. See the picture for an example. Please watch our video by clicking play below or CLICKING HERE. We will be wearing helmets (and probably knee and elbow pads!) when on the main roads and certainly for the race itself. Kevin and I are looking forward to the challenge and we shall be videoing the entire ride using a GoPro, so watch out for the edited version after we finish. We will upload it to the News section of #InTandem on our website and to all our social media websites.